Carl Suhrlandt was born into a family of artists, the son of Rudolf Friedrich Carl Suhrlandt (1781-1862), a painter, lithographer and draughtsman, and Wilhelmina Suhrlandt, a lithographer. He was a pupil of Ary Scheffer in Paris. From 1859-1860, he worked in Copenhagen, and then moved to St. Petersburg where in 1861 he became a member of the Academy. He finally settled in Schwerin where he worked as a professor at the Art Academy. Most of his paintings depict animals with a preference for horses and dogs. 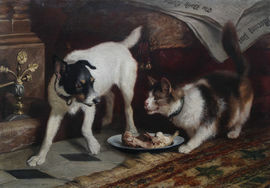 He made several visits to England where he painted similar works commissioned by the aristocracy- a typical title of this work would have been “In the Kennel” (1885 oil on canvas). His work is held by the Museum in Schwerin with a piece entitled “Galileo in prison”.